Dan Abrams and Nancy Grace discuss the trial of a woman accused of killing her ex-boyfriend. Let's get more from our legal team, nancy grace, who has been covering the trial for her show on hln. And our legal analyst, dan abrams. Nancy, I have to begin with you. You reported on your show last night, that jodi may have been willing earlier to plead to a lesser charge. As a matter of fact, she wanted to plea to a lesser charge. What we learned from the defense memoranda was that a couple of years ago, she actually approached the state and wanted to plead guilty to a second-degree murder charge that carries a penalty of up to 25 years. There's two days to show it. Number one, extreme indifference to human life, like drag racing. And the other is killing without premeditation. They actually wanted to plea to that. But the prosecutor said no way. It wasn't enough time for jodi arias. Are you surprised at that? I'm not surprised that jodi arias wanted a second-degree murder conviction. That's really the goal here, as far as I'm concerned. When you look at the amount of evidence here, and her own statements, of course, she wants a second-degree murder conviction. I don't think her lawyer, i don't think jodi arias expects there's a real shot she's going to walk away with an acquittal here. A second-degree murder conviction or a plea would have been a big win for jodi arias. I'm surprised prosecutors said no. As they mount their defense what is the best strategy going forward? For the defense? I think they have to call jodi arias. On the one hand, you're increasing the chance of her getting a lesser conviction. The other option is, don't have her testify, wait until the penalty phase, put her on on that point and beg for her life. That presumes you're going to get a first-degree murder conviction. And then, you're going to try to save her life. If she takes the stand now, bigger gamble. Maybe there's a chance the jurors connects to her. A juror connects to her in some way, shape or form. All she has to do is get one juror to connect with her in some way, right? Well, that's all she's got to do. And the defense is betting on with the battered women defense theory, which I believe is totally unfounded, they plan to bring on an expert named alias viloette. The title of one of her speeches was -- was snow white a battered woman? It's hard for me to take that seriously. But I think we're glossing over here. And you're just analyzing it, like it's a spectator sport. It's not. There's a dead man. 29 stabs. And a gunshot to the head. What is disturbing to me is this woman was prepared to swear under oath, on the bible, that she murdered him. And now, she wants to plead self-defense. Now, it may be a game to everybody else what they put in front of a jury. But I take it very seriously. And if yesterday she was ready to say, I did it, show leniency, I murdered him. And today, she wants me to buy a crock called self-defense? That disturbs me. This is not a great example. It's possible in another case, someone could believe the chances of them getting convicted are so high that they don't want to take the chance of going to trial. And they're willing to take a second-degree murder conviction, even if they believe it was self-defense. In this particular case, that's not a great -- right. To them, it's a crap shoot. They're like in vegas. They don't care about the truth. Nancy -- I care about the truth. Prosecutors every day make decisions based on gambles. Is it worth taking this case to trial? Are we willing to take a plea to avoid going to trial, et cetera. Those are gambles that prosecutors take every day. We have to end -- when I look back on prosecuting, I always tried to do the right thing. When I was at that jailhouse yesterday, I ran into so many women as I was walking the halls, that she has convinced that self-defense is going to work on the jury. We'll see what happens. The last thing that jodi arias wanted was nancy grace at the jail. I'm sure that's right. Lawyers for Arias will argue she acted in self-defense when she stabbed her ex-boyfriend. Ryan Owens reports on evidence in the rental car Arias allegedly fled the crime scene in. Jodi Arias Murder Trial: Was It Self Defense? Nancy Grace and Dan Abrams discuss the trial of a woman accused of killing her ex. 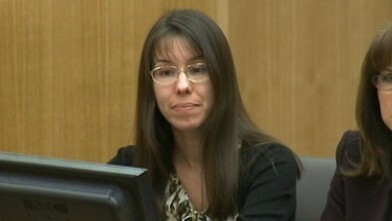 Now Playing: Jodi Arias Murder Trial: Was It Self Defense?